Few people today look at their stockings and marvel at the manufacturing technology or the knitting artistry that produced them (unless they’re wearing handknitted socks). Victorians, however, did both at the Great Exhibition of 1851. John Timbs, documenter of the Exhibition, explained Prince Albert’s goals in some detail: In 1846, the royal consort called together the captains of British industry and asked them to support a Great Exhibition of the Works of Industry of All Nations. The prince exhorted the members of Britain’s Society of Arts to “wed mechanical skill with high art,” following the tradition of French exhibitions. Too often, he feared, the rush for profit led to tawdry, tasteless, and cheap mass-produced goods, while the dream of perfection led to beautiful but exorbitant handmade works of art. The Great Exhibition should showcase and reward companies and individuals who blended art with manufacturing, creating beauty accessible to the masses (The Yearbook of Facts in the Great Exhibition of 1851). Surprisingly, knitted stockings could serve all these purposes. 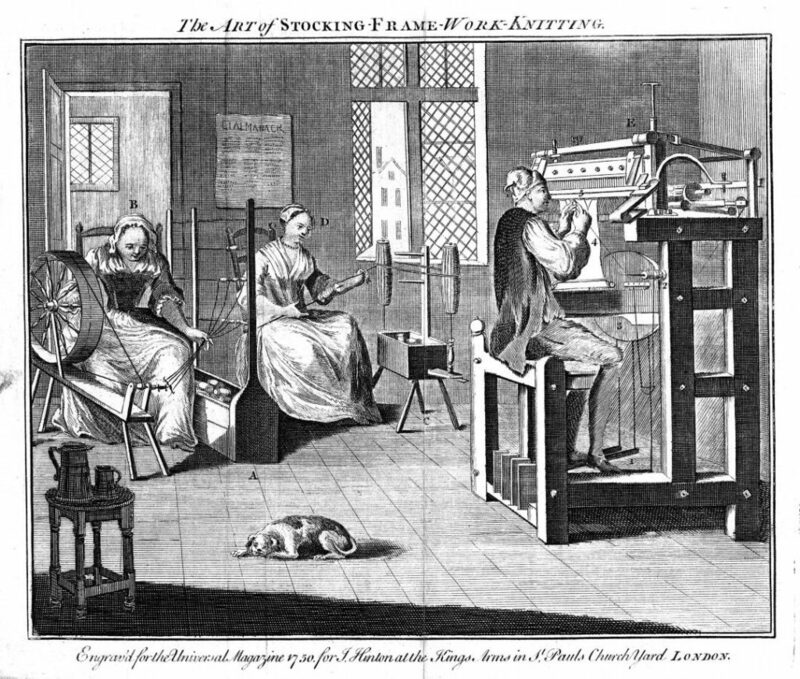 A stocking frame workshop, with a man operating the knitting frame and women reeling yarn. From The Universal Magazine of Knowledge and Pleasure, London, 1750. Photo by Universal History Archive/Getty Images. More than 14,000 companies brought exhibits from around the world, with goods ranging from steam engines to stained glass to lumber to lace stockings. Over a hundred exhibitors displayed machine or handmade knitted goods and the knitting frames that created them. Knitting exemplified Prince Albert’s goal of combining beauty with mass production. Charles Babbage, an Englishman who documented the Exhibition’s origins, wrote in 1851 that the fine art of a delicate handknitted shawl was once only available to the wealthiest women. Now, with improved machine-knitting equipment, knitted lace could be mass produced and sold to lower- and middle-class women as well. Certainly, inexpensive machine-made goods filled the homes and closets of Victorians. The Exhibition displays, however, provided a more complex view of British knitting and its place within society. Both handknitted and machine-knitted garments were displayed at the Crystal Palace, and both types won jury prizes for excellence. Because virtually everyone in Britain wore stockings, handknitters and knitting frameworkers produced thousands of pairs each year. Women typically worked as handknitters, carrying their projects with them and knitting as time permitted, and men usually ran knitting frames because the heavy wooden equipment required great strength. Although framework knitting was concentrated in Midland towns such as Leicester, Derby, and Nottingham, handknitters could be found throughout the countryside. To meet the British demand for knitted garments and hosiery, the needles of the nation had to be wielded by fingers and machines. 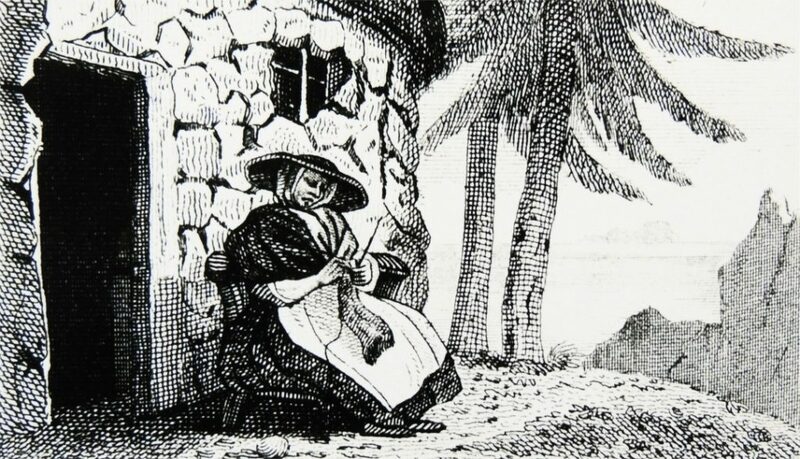 In the nineteenth century, women across the British Isles knitted at home for their families. “Commercial” handknitters also sold their work to bring money into the household. Victorians encouraged the poor and disabled to support themselves through handknitting, and visitors to the Great Exhibition applauded their work. London firms displayed handmade knitwear at the Exhibition, which they often imported from the farthest edges of the British Isles. Contemporary newspapers revealed the economic circumstances under which knitters produced these goods. The Morning Chronicle noted that “there are . . . many specimens of the hand-knitted woolen hose of the south and west of Ireland among which . . . are some made by the children of Ballandine in the County Mayo, . . . which are remarkable for their regularity of workmanship” (September 11, 1851). During the depths of Ireland’s Great Famine, the skillful knitting of young people could help support their families. The Exhibition catalogue reveals many displays with similar backstories. At William Baillie’s stall, visitors could see ladies’ stockings, handkerchiefs, children’s frocks, and veils handknit by Shetland Islanders using local wool. “Knitting,” the Exhibition Catalogue stated, “is the chief employment of the female inhabitants on these isles in their own homes.” The beautiful handwork of the Shetland Islanders was as critical for their survival as it was for children in Ireland. Handknitting, in fact, had contributed greatly to regional economies, especially in times of famine. In 1846, potato blight reached northern Scotland, ravaging crops there as it had in Ireland. The Highland Relief Board quickly distributed grain and provided employment to “infirm men and women in knitting and spinning,” according to the Edinburgh paper Caledonian Mercury (February 8, 1847). By August 1847, the newspaper reported improved conditions in places such as Shetland, which combined subsistence potato farming with fishing and knitting (August 9, 1847). Indeed, the Shetland knitters provided such a successful financial buffer that the Highland Relief Board decided to copy their success on the hard-hit Isle of Skye. In 1848, the committee established a spinning mill on Skye to process local wool into yarn for island sock knitters. By 1851, the committee reported that the company made 137 pairs of socks per month and employed ten women at the mill and 1,050 women as knitters (as related in London’s Morning Chronicle, December 27, 1851). Back at the Exhibition, judges awarded a jury prize to the work of Highland knitters shown by textile merchant Donald MacDougall from Inverness, Skye’s shire seat. The Great Exhibition also featured stockings knit by machine; indeed, most of the knitting manufacturers at the Crystal Palace included hosiery in their displays. T. Holland and Co. received a jury prize for fleecy hosiery for medical uses. Several companies received prizes for low-cost stockings and others for high-quality silk, cotton, and wool hose. Of the 212 exhibitors in the clothing category, at least thirty displayed frame-knitted pieces (mostly stockings) and nineteen won prizes for their workmanship. J. and R. Morley of Nottingham won awards for its display of ultrafine cotton and silk hose. Nottingham was one of the Midland centers for machine knitting. A local curate named William Lee invented the stocking frame in 1589, thus founding the machine-knitting industry. The first frames made coarse woolen stockings, but improvements to the machines later allowed them to produce stockings in thinner silk yarns. Queen Elizabeth I refused to grant Lee a patent for his stocking frame, fearing that it might drive handknitters out of business. 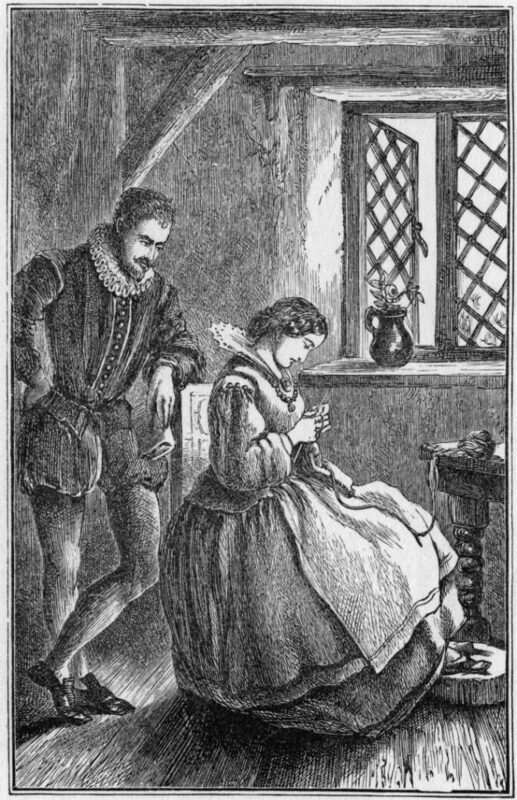 Lee moved his production to France, but after his death in 1616, his brother returned to England and established frame knitting in London. By 1641, there were stocking frames at work again in Nottingham. William Lee, sixteenth-century inventor of the first knitting frame. According to legend (repeated in this illustration), he got the idea for his machine after watching his wife knitting by hand. Wood engraving, nineteenth century. Photo by Universal History Archive/Getty Images. Knitting frames functioned rather like mechanized knitting spools. In Lee’s design, the frameworker sat on a bench in front of a large wooden frame mounted with a row of horizontal hooks. Beginning with a row of stitches on the hooks, or needles, he laid a strand of yarn across the hooks in front of the stitches, then brought a metal sinker plate down between the needles that pushed the yarn into loops over the hooks. The sinker then slid the yarn forward until the loops caught in the hooks. A presser bar came down and forced the hooks closed, keeping the loops inside. As the sinker continued forward, it pushed the old stitches off over the closed hooks and formed the next row of knitting. When the presser and sinker moved back to their starting positions, they slid the new stitches back to the ends of the hooks so that the next row could be made. 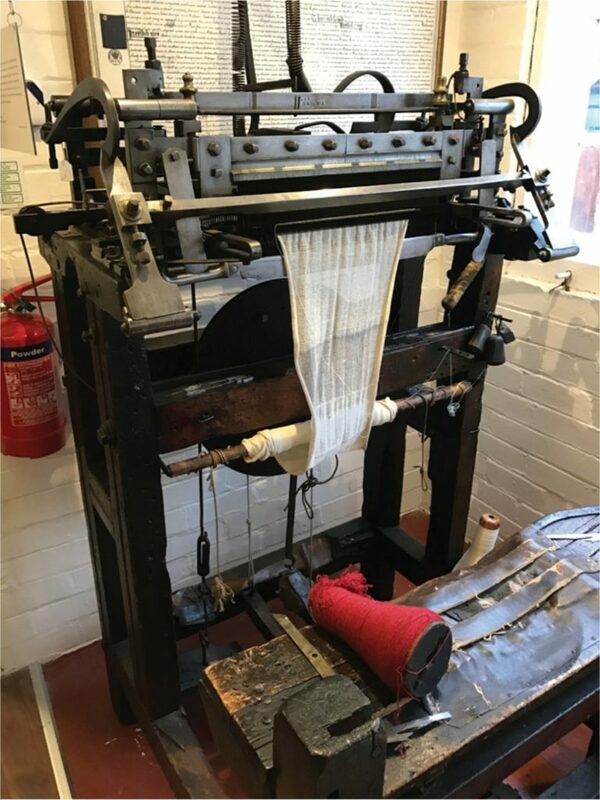 The frameworker controlled the machine by moving levers with his hands and feet and manually shifted loops between the hooks to increase or decrease the number of stitches or to add lacy effects in the cloth. Over the next century and a half, the stocking frame and the lives of frameworkers changed very little. Frame knitters worked at home on a frame that they either owned or (more often) rented from a master manufacturer. The husband ran the heavy machine while his wife and children wound bobbins, seamed the flat pieces of socks, and added ribbing by hand. The stocking frame could only produce stockinette cloth, so when ribbing was necessary, women dropped stitches down the finished fabric and then picked them up again purlwise, creating ribbing by hand. The family shared in the income from the stockings they made, after deducting costs for the frame rental, maintenance, and weekly travel to and from the manufacturer’s warehouse to get yarn and return completed stockings. I make stockings at 1s 3d per dozen pairs… at my employer’s frame, he finding the materials, and I cannot under severe penalty of law work in his frame for anyone else. He only gives me as many stockings as he thinks proper. I have never received from my employer more than 1s 3d a week although I have never made for him . . . less than 6 doz of stockings per week. I am now existing on what I get from the parish and what I get from my employer—although I get from the parish three loaves more than what I get from my employer, still the parish gets no benefit from my labor. Frameworkers in the stocking industry. Illustration in J. H. Quilter and J. Chamberlain’s Framework Knitting and Hosiery Manufacture, Volume 1, 1911. Photo by NEMPR Picture the Past/Heritage Images/Getty Images. As long as frame knitting remained a cottage industry, with knitting families spread throughout the cities and countryside of the Midlands, abusive employment practices remained common. Manufacturers had little incentive to upgrade machinery that remained largely unchanged since its invention in the sixteenth century. The invention of Jedediah Strutt’s ribbing attachment in 1759 and attachments that created lace patterns made little difference in the daily lives of the frameworkers. Then, in 1816, M. I. Brunel invented the circular knitting frame, and in 1847, M. Townsend developed a variation that could produce ribbing. The stage had been set for the full mechanization of frame knitting and the movement of frameworkers into the better working conditions of factories. By the time of the Great Exhibition, visitors marveled at Peter Claussen’s circular knitting frame, patented in 1845. Unlike Brunel’s design, it could run either with a hand crank or by steam power. The Morning Chronicle reported that because this frame was easy to use and required little physical strength, girls as young as fifteen could manage several feeders at once, producing up to twenty-dozen socks (August 25, 1851). Because Claussen’s machine automatically moved the yarn in a spiral, it could knit much faster than previous designs. 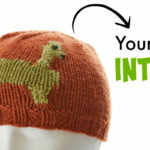 It also could use softly spun yarn, which expanded the range of knitted items that could be produced. 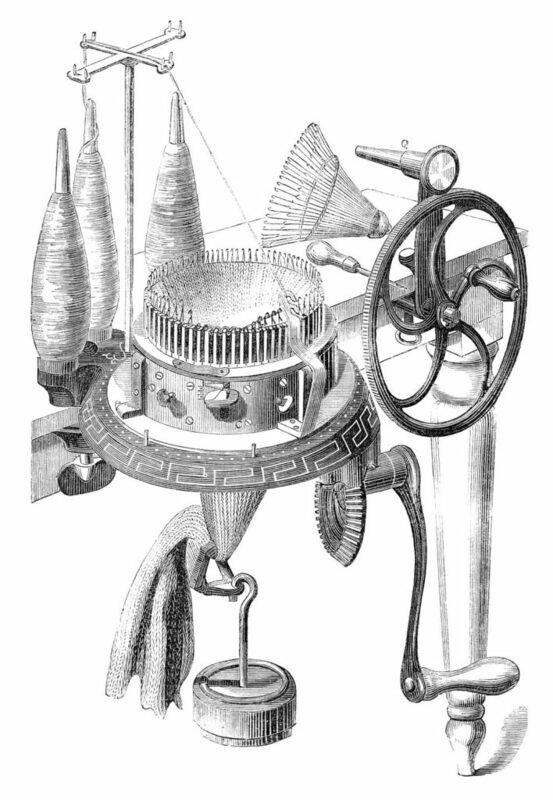 Claussen’s popular machine was already in use before the Exhibition; The Morning Chronicle credited it with helping to bring low-priced hosiery production back to Nottingham (November 1, 1851). The judges of the Great Exhibition awarded Claussen’s circular knitting frame one of the coveted Council Prizes. Council Prize winners demonstrated “important novelty of invention or application,” and Claussen’s simple, lightweight circular frame certainly fit the bill. Innovations like Claussen’s would slowly end the misery and isolation of frameworkers as they moved into factories like the new steam-driven mill built in Nottingham in 1851. A circular knitting frame with a hand crank shown in a woodcut from 1871. Photo by iStock/Getty Images. When the Great Exhibition closed on October 11, 1851, over six million people had visited. On shilling days, even members of the working classes could afford to attend—though this entry fee was still beyond the means of The Poor Stockinger of Nottingham and handknitters in Ireland, Shetland, and Skye. Yet people who couldn’t travel to the Crystal Palace had read about the fine art and the manufacturing genius of the exhibits and seen illustrations in newspapers and commemorative books. On the week of July 19, The Illustrated Exhibitor published “a large, double-page Engraving of the Queen and Cortege inspecting the machinery Department, in addition to Engravings of . . . [the] Invention of the Stocking Loom; the Stocking Frame, [etc. ].” Even if the names of the knitters were rarely spoken at the Exhibition, millions marveled at their workmanship, their tools, and the prizes their labor won. 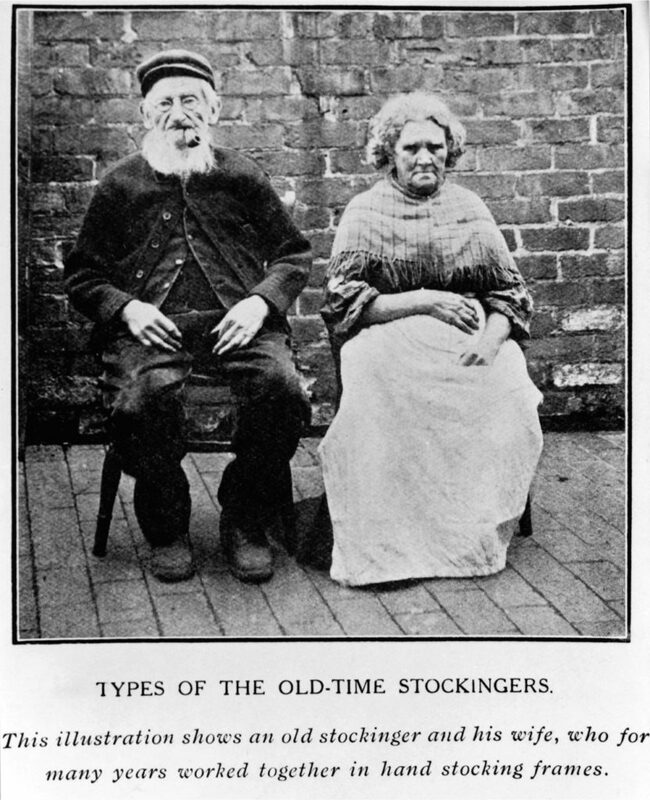 Frameworkers and handknitters alike wielded the needles of the nation, dressing inhabitants of the British Isles in plain and fancy stockings. 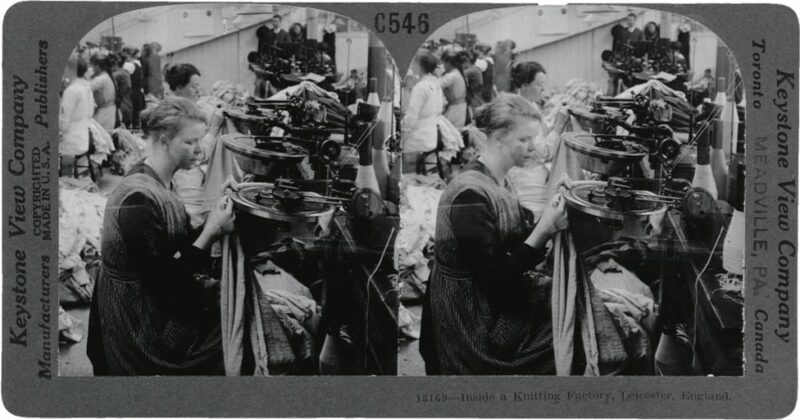 Women in a Leicester knitting factory operating large circular knitting frames, early twentieth century. Photo by Library of Congress/CORBIS/VCG via Getty Images.